The work of New Zealand-based Wildboy Studios (in conjunction with writer Rebecca Haigh and the music of Luminist), ATONE drops players into a gorgeous 2d adventure rooted in Norse mythology. With a strong story focus and a unique combat system, the game defies convention to provide a refreshingly new user experience. Special thanks to Jim DeLuca at Get A Life PR for his coordination efforts, and I was excited to chat with the team (Sid Bardiya, Ben Costeloe, and Patric Corletto) about their project. EM: ATONE’s narrative takes Estra on a journey investigating her father’s death, incorporating Midgard, the Elder Tree, and a mysterious gemstone as key points of orientation, so as devs taking on mythology with an emphasis on story, what writerly elements and tools do you lean on to make the experience feel cohesive and true to the Nordic mythos? How do you make sure the game’s pacing and NPCs pull the player along? 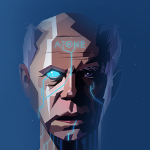 ATONE: We are trying to forge a story that intertwines with all our gameplay elements. For example, every battle and puzzle has an effect on the story, every reward/item you find/get is one that is inspired by Norse history, You can even buy mushrooms that make you hallucinate (which is something the vikings ate before they went into battle). We have violently studied Norse law and history to make our world and story feel as immersive as possible; even our writer is trying her hardest to build character dialogue inspired by how vikings may have spoken. Hopefully, all these pieces will combine and form something wonderfully Norse and cohesive. On the other hand however, our lore, characters, and overall story are inspired by Norse mythology, but we have tried to create our own path with ATONE’s narrative. Not everything in ATONE is straight out of norse books, actually most of ATONE is completely made up, but that leads to why we chose Norse to base our story around; we chose it because it’s a religion full of stories and characters that all have many different interpretations, making it a highly durable mythology to base our own story on. We really feel that our story and characters will leave people, especially Norse fans, interested in seeing what is around the next corner. EM: While the game does have combat, dialogue and puzzles take center stage, so as you’ve created game elements and interactions, what philosophies direct these dominant features, and what goals do you have for them, in terms of their contribution to gameplay as a whole? What constitutes a satisfying conversation, and how do you incorporate puzzle solving as a seamless part of the adventure? 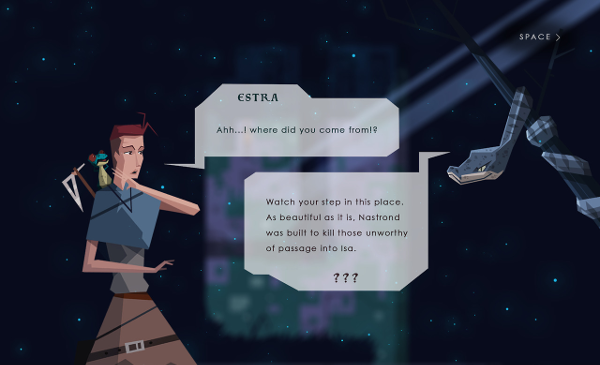 ATONE: Some underlying ideas that are present in our main features are ones that connect the puzzle, battles, or conversations with characters to the story. For example, with the battle, before you start fighting to the beat of the music, you can sometimes get a chance to use your wit and talk your way out of the battle; this means the enemy can turn into an ally at times and reward you either later on, or straight away, also, sparing someone can lead to separate story lines that we think will surprise. As for the puzzles, along your journey, you can find them in the form of moss-covered nodes, tree carvings, wall drawings, large stone blocks, and so on. We have tried to incorporate every physical puzzle into the lore, and the idea that no way forwards is blocked by a puzzle made up of shapes that we would understand today, but by shapes that would be found in the time of vikings drawn on houses, or on trees in the forest. Also, along this journey, you will bump into countless creatures and colourful characters that can often be stumped on a puzzle that they need help with, or want to challenge you on. Many of these puzzles can be left unsolved and also failed/deactivated, which we feel gives the puzzles more intensity and makes the overall journey feel like something that is breakable and can be failed in part. We like the idea that a lot of our puzzles are sharp and unforgiving; some can even physically hurt you. EM: Your combat system strikes me as unusual, grounding itself in the rhythm game genre, resulting in what you refer to as ‘an epic slow-motion hack-n-slash, where the player’s ability to sync button combinations with the beat of battle-specific songs will dictate who lives and who dies.’ You further note that each fight gets its own music, so I’m interested in what inspired this particular form of conflict resolution and what you see as challenges to engagement for players who may not have experienced a system quite like this before. Similarly, as developers, what balance considerations do you give to each battle? ATONE: Well actually, one day we were sitting behind someone in a mall having lunch as they were playing Tekken. This was back when we were trying to re-create our battle, which was originally a hack n’ slash. The reason we wanted to do something different was because although the hack’n slash is an awesome and fun mechanic, we wanted something that felt more personal and connected the players more, with the stars of our game being the characters. So after watching this person playing Tekken sneakily from a distance, we decided that maybe something in a similar vein could work, but to the beat of synth wave that worked cohesively with the electronic music our composer was creating for the main game. After a long time storyboarding and looking at games like Final Fantasy and Persona 5, we designed this strange Guitar Hero/Tekken inspired battle system that we really think could work nicely; recently, we have been looking a lot at Samurai Jack and we are in the process of creating a dynamic and stylized battle system, hopefully this ends up becoming something where every battle looks and feels different. In terms of how we cater for people both experienced and inexperienced with these types of systems, we plan to make at least two different difficulties. Also, another thing about ATONE is just like with the puzzles, there are a lot of battles you can either avoid or talk your way out of if you are more interested in a battle light journey. 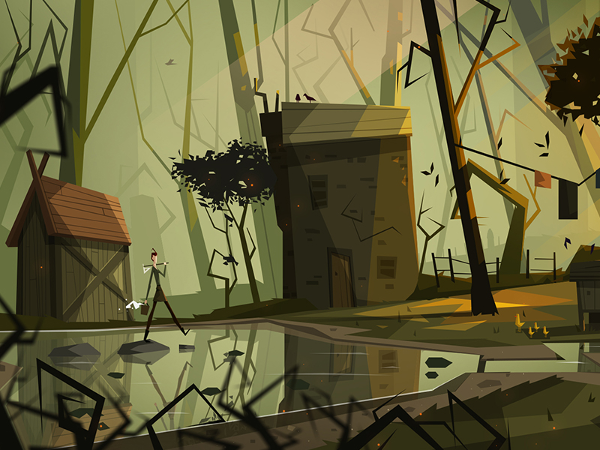 EM: When it comes to the unique 2d art of Atone, you give a nod to Genndy Tartakovsky and the landscapes of Monument Valley; given the wide variety of games and art styles, how do you see your angular, high contrast assets informing gameplay? Where many smaller studios chose 2d over 3d and seek to create a specific aesthetic, what themes come with your look? ATONE: Everything is hand-drawn with a lot of time and effort going into all of ATONE’s details. Every character and setting has distinct details we think play nicely into the battles and especially the puzzles. Our artist has also crafted everything in the environments and characters using sharp angles and weird shapes while playing with curves and simple shapes for the UI to contrast it from the abstracted and straightened design of the characters, environments, and puzzles. 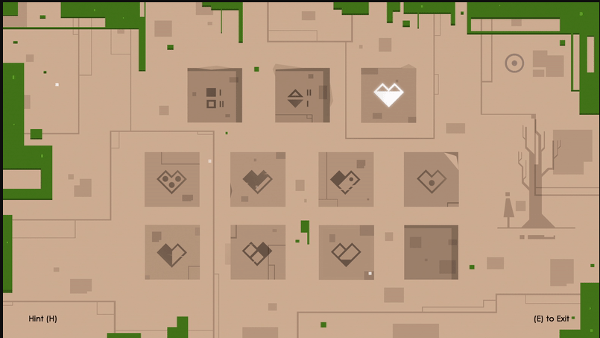 Making a top down 2D puzzle game was really something we wanted to do since the beginning; we were very inspired by how ‘The Witness’ encourages you to look around the environment for hints on how to solve a small puzzle. We wanted to do the same, but with slightly strange looking environments and structures that often need several moments to decode what they are. In a way, we have tried to make a world that slowly gets more and more abstract; we basically consider the world as a simple puzzle, too. EM: Wildboy Studios is comprised of Ben Costeloe, Patric Corletto, and Sid Bardiya, and the project also incorporates the writing of Rebecca Haigh and the music of Luminist (a.k.a. James Shuar), with publicity and marketing coordinated by Jim DeLuca at Get A Life PR. This means that while the team remains small, there are a number of moving parts, so can you walk me through an example of what content creation looks like? What kinds of communication challenges come with your varied responsibilities, and as you move through the creative process, what feedback do you give each other? ATONE: The overall production of ATONE for us has mostly been spent on the story and coming up with a basic script. From there we sent a draft script to Rebecca (our writer/editor) who would read it and provide us with edits and tweaks. After these changes are made to certain story parts, Rebecca would start rewriting all character dialogues and story node scripts. Then we moved onto level design, which is what the environment would look like. Then, planning how the story & characters progress within the environment. After we had white boarded all of that, it was time to create and move into the design and animation phases. And then, once the assets are created, we import them into Unity and start building the scene. Then James (our musician) will play the scene and decide on the music and sound effects that needs to be made for that scene. There are a lot of moving pieces when it comes to what people have to do. So to keep track of all of this, we use simple tools such as Trello to assign cards to each team member on what to get done. It’s usually an agile process where we have a sprint goal and a number of tasks for each of us to accomplish. As we are an international team with multiple time zones to keep in mind, we usually try to catch up once a week via a voice call to see how everyone is doing. EM: Your project has drawn a lot of good attention this last month with write-ups from larger game sites, but I notice you also do a fair amount of shout-outs to other games (Unforseen Incidents, Forest of Liars, and Faeland constitute a few Twitter examples); as developers, how do you see the indie game community working together, formally and informally, and what kinds of interactions do you see taking place, in terms of comradery or inspiration? ATONE: This community is awesome; we have spoken with countless indie developers who have been more than happy to share their experiences with us, which is considerably helpful because this is our first title as a studio and we do lack experience with this whole process. We have also taken probably more inspiration from other indie games than we have from AAA games in terms of style, animation, marketing, trailers, and other elements. This is because a lot of indie games are better comparisons when it comes to things like the team size and budget behind them. EM: The first time I watched your trailer, I did so with the sound off, mainly because I like to focus on visual details separate from audio details, but not surprisingly, when I watched with audio on (as intended), I found high production values and a rich interplay between seeing and hearing that I often don’t experience. You’ve spoken to incorporating audio into combat, but in terms of overall gameplay, what things do you see as key in effective multi-sense (sight/sound) engagement with an audience? ATONE: Our game mixes highly intense battle sequences with things like puzzles, peaceful journeying and emotional cutscenes. So it’s very important to find a cohesive style that fits everything and doesn’t allow a disconnect between gameplay features. What we are really aiming to do is to keep the venturing and puzzles mostly shrouded in environmental sounds, overall retaining a consistent magic/electronic vibe throughout our sound design (including in the battle and cutscenes). The puzzles will have sounds which are peaceful, calming, and not distracting, while the battles obviously need epic tracks that get your veins pumping; some of these tracks will have more emotion behind them than others, depending on the circumstance. Another thing James wishes to add to the battle music is layers, which either disappear if you you get hit or reappear if you deal critical damage, adding to the feeling that you are either on a roll or almost dead. Overall, there are lots of sound and music ideas we are very excited about. EM: One thing that fascinates me with indie games is the level of thought that goes into the creation of a specific game universe and how that world differs from our own. Given the fact that many games/graphic novels/fantasy novels have represented Norse gods in various ways, do you feel the need to clarify nuances of Midgard, so as to inform players better on the inner workings of things? What other kinds of world/history building has gone into Atone, and as developers, how far do you let yourselves go down that rabbit hole? 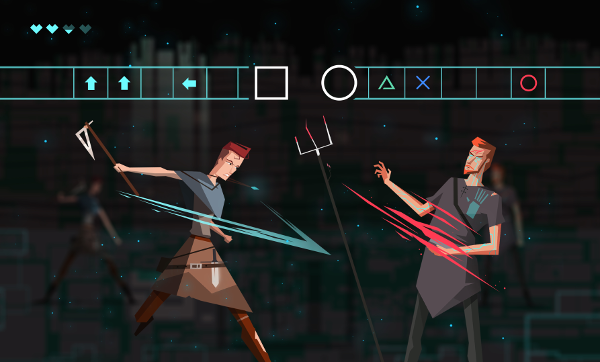 ATONE: We have tried to go deep down a road that distances this game from others that base their stories/worlds around Norse myth, and we reckon we are doing this by taking inspiration from the worlds of Game of Thrones and The Last of Us. The thing that viking culture has in common with The Last of Us and Game of Thrones is disturbing violence, loss, and an uneven sense of morality. ATONE really is bright, colourful, peaceful, full of characters that love each other and so on, as it might seem from the trailer. But at its core, there are things we hope to present to people that make them think in a different way – the puzzles or the battles will make them think. These things leave the player completely unsure about what lies over the next bridge or through the final cave.